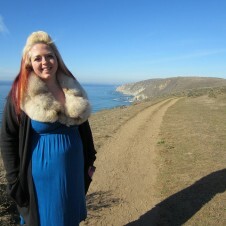 When I was a teenager living in sunny Northern California I completely resented the sunlight for being so cheerful. I was a surly, depressed and unhappy teenager who had been relentlessly bullied in my childhood and middle school years. I think it was to be expected. What I didn’t realize that upbringing was doing to me was making me unsuited to any other climate. The first few years I was living on the East Coast I wasn’t really in touch with myself and my emotional well-being to understand that what was happening to me in February and March was seasonal depression, but as I’ve learned more about it and developed coping strategies I actually can see when it creeps up and I know how to stave it off. 1. UV Therapy Light: I use a UV lamp (aka “Happy Lamp”) every single day for at least 15 minutes but usually 30. I flick it on first thing in the morning when I do my journaling and I sit right next to it. If I’m not journaling I’ll read or sit on my computer. It really works. The one I have now was a hand me down from a friend and I’m thinking of getting a travel one because mine is kind of big and hard to move around. I start my UV light work in late November and lasts until it feels like Spring is really happening. Here’s a version from Amazon that looks handy and small. 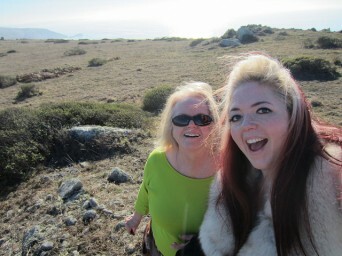 When I was visiting my mom for Christmas we went on a hike at Point Reyes for my birthday (which is Christmas Eve). I also know some folks who go tanning (the bed kind, not the spray kind) and have said it is mood altering, but of course there is the skin cancer risk. 2. Vitamin D: I start taking a Vitamin D supplement in October. Just one additional pill on top of my multi-vitamin. 3. Walking: I walk for 20 minutes every day and I try for that walk to be around noon when the sun is at it’s highest. Even in the snow. I try to do this all year long but I have a heavy emphasis on this in the Winter months. I have a dog so that really acts as an impetus to walking. This is the present-day backyard at my mom’s house. My teenage bedroom window is on the right. It’s waaaaaay nicer in the backyard than it was 20 years ago. 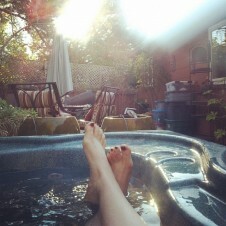 When I was home for Christmas I spent each morning of my 2 day stay in the hot tub. 5. Keep the blinds open: Part of my morning ritual is opening the curtains up in my room. I’m on the second floor, which is great for birdwatching but not so great for light, but those little bits of sunlight that occasionally peek through are important to me and it reminds me that there is a world turning outside and it’s not perpetual darkness. I hope these help. It’s not too little too late, when I find myself off the bandwagon within a couple of weeks I can feel the effects of my seasonal depression strategies at work again. Posted February 25th, 2014 & filed under Health.